Lily Chow was front and center in Victoria on Tuesday when the government introduced an act to repeal legislation that discriminated against Chinese Canadians. 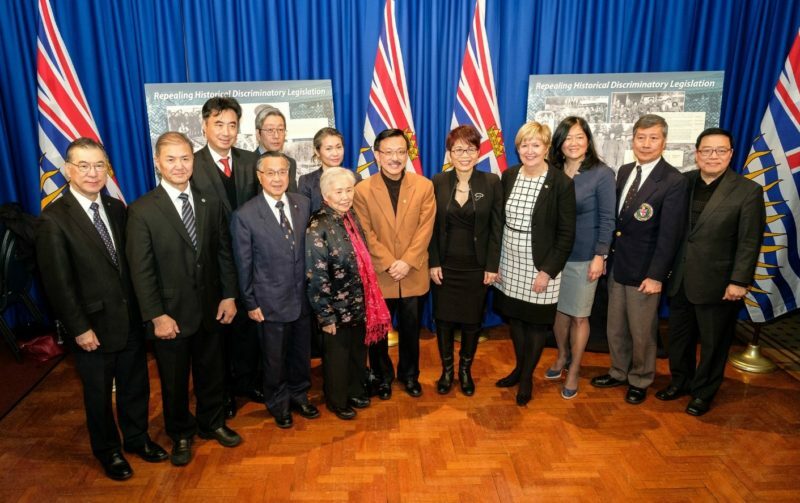 Chow, a member of the Legacy Initiatives Advisory Council (LIAC), was among the representatives from the Chinese-Canadian community at a press conference at the B.C. Legislature where the act was introduced. The Discriminatory Provisions (Historical Wrongs) Repeal Act will remove discriminatory provisions in historical private legislation. It delivers on a commitment made in to review discriminatory legislation as part of the government’s pledge to address historical wrongs committed by past provincial governments against Chinese Canadians. Teresa Wat, Minister of International Trade and Minister Responsible for Asia Pacific Strategy and Multiculturalism, Attorney General and Minister of Justice Suzanne Anton and Minister of State for Emergency Preparedness Naomi Yamamoto spoke to the importance of repealing the discriminatory acts still on the B.C. books at the press conference. “Some of the legislation discovered during the legislative review is reflective of a dark time in British Columbia’s history,” said Wat. The Province reviewed nearly 2,000 pieces of legislation dated from 1871, the year that British Columbia joined Confederation, to 1982, the year the Canadian Charter of Rights and Freedoms was introduced, to remove historical provisions (in legislation) that were discriminatory on the basis of ethnicity or place of origin. The “Chinese Legacy BC: Legislation Review Report” released on March 7 identifies 19 obscure historical private acts that contain discriminatory provisions. The private Acts dating from 1881 to 1930 enabled a particular business activity such as mining or transportation. Most of the discriminatory provisions in these private Acts restricted employment based on ethnicity and some allowed for the imposition of penalties if breached. Chow is an active member of LIAC, who works with Chinese Canadian communities and other key partners to ensure that legacy projects are known and communicated throughout the province. She’ll also take part in the unveiling of commemorative plaques at Chinese cemeteries in Ashcroft and Kamloops and in Barkerville Historic Town’s Chinatown on March 17, 18 and 19. Busloads of Chinese Canadians will attend these plaque unveiling events on a historical tour of the Interior. The group and tour is being organized by the Chinese Cultural Center and the National Congress of Chinese Canadians. NPTGS is a non-profit organization committed to developing local economies in the Hope to Barkerville corridor through heritage tourism development, First Nations reconciliation and Multiculturalism. The Society is currently working with the Ashcroft Rotary and Lions Clubs on the Harmony Project, which will see the construction and installation of a large piece of public mosaic art and a Peace Bell in a covered structure at the entrance to the town of Ashcroft. It’s intended to acknowledge the contributions of Chinese, First Nations and other nationalities to the building of the community and region. The Society gratefully acknowledges the financial support of the Province of British Columbia.